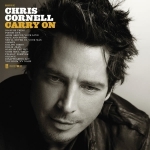 Chris Cornell’s second solo album, Carry On was released to stores in the United States today. On the album is the Casino Royale theme “You Know My Name”, which was absent from the film’s soundtrack (though available as a single on iTunes). And since I’m on the subject of music, Paul McCartney released his solo album yesterday, Memory Almost Full.